Today, I did day 26 of the DO YOU YOGA 30 Day Challenge. It was called “Like a Tall Drink of Water.” The video was a great combination of backbends, forward bends, and twists. I’m still working on my balance, and I really did have to focus today. Today’s practice also helped to relieve some tension that has been building up in my back. Unfortunately, I woke up in a bad mood and with a bad headache. Today’s yoga practice didn’t really put me in a better mood, like I hoped it would. Instead, my mom and I ended up going out for lunch. We went to the Committed Pig in Manasquan, NJ. It was our first time there and I was incredibly impressed. I ordered the baked brie burger, which had brie, bacon, and fig preserves. My mom ordered the triple b, which was bacon, blue cheese, and balsamic glaze. We both got side salads instead of fries. I’m sure the burger sent me back a million calories, but it was delicious and I have absolutely no regrets. After, we went to visit a former co-worker of my mom’s who had recently opened a party supply store in the area. It was nice to see her and her business. When we got home, I watched an episode of Twin Peaks and took a nap. I still don’t feel 100%, but I hope this headache goes away by the time I have to be at work tomorrow. 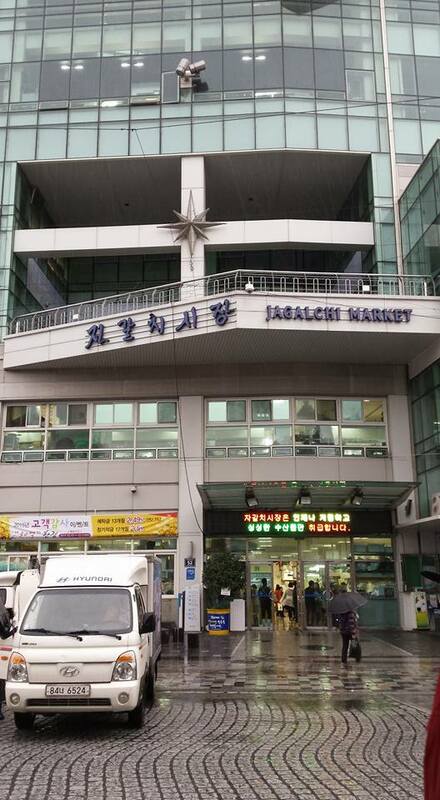 *Note: in this post, I will be writing about my experience at the famous Jagalchi Fish Market and it features some slightly graphic paragraphs about consuming extremely, err, “fresh” seafood. You have been warned. On Saturday, Steve and I had plans to spend the weekend in Busan. After staying out all night, it was a struggle to get going, but we made it on the bus to Nopodong terminal around 1 PM. The ride was roughly 45 minutes and the bus we got had very comfy seats. It had already started raining by the time we got there, and we ran around trying to find the subway. From Nopodong, we made our way to the Jagalchi station. Our plan was to spend Saturday seeing all the outdoor markets. Even though it was raining, we decided to push through. We first decided to find a motel. After being turned away from two due to no vacancies, Steve and I happened to come across a little guest house. What the heck. We walked up to the fifth floor. We were able to get a room… with twin bunk beds. However, there was a nice view, the bathrooms were clean, and there was free breakfast in the morning. It was acceptable. 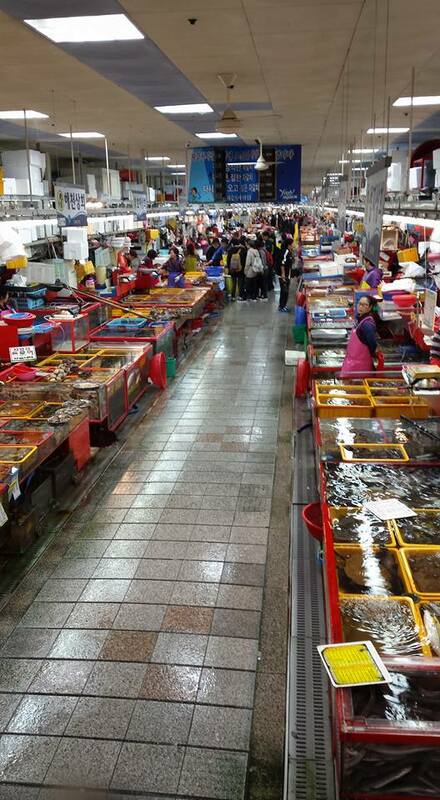 After dropping off our bags, we walked to the famous Jagalchi Fish Market – the biggest in Korea. As soon as we walked through the door, we were greeted by countless stalls with people selling their fish. Big fish. Little fish. Octopus. Squid. Clams. Mussels. Conch. You name it, it was at Jagalchi. Water spilled over the brim of the tanks and onto the floor. From the rear of the market, there was an amazing view of the bay. Too bad the skies were dark and rainy that day. Like typical tourists, we “ooed and ahhd” as we walked by each stall. After making our way around the first floor, we walked upstairs. This is where it got good. The entire second floor is made up of mini restaurants selling the freshest fish. (You know it’s fresh because you are literally watching people kill it left and right.) It was overwhelming. 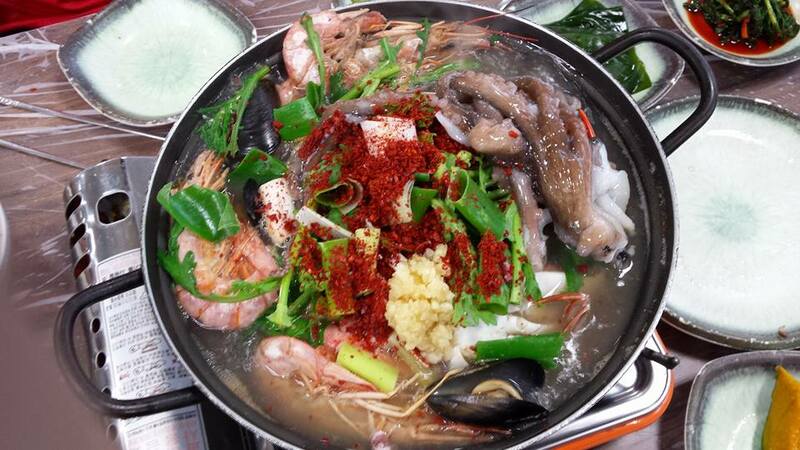 After looking at about several menus, we picked one restaurant and ordered the seafood stew. We were not ready for what came to our table. 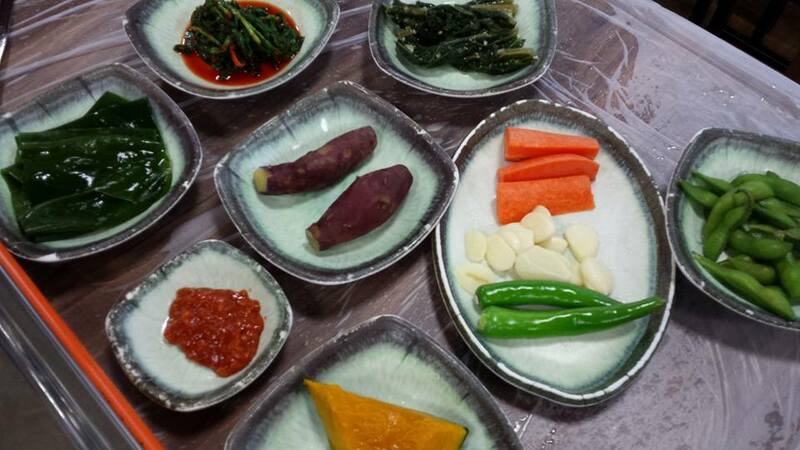 First off, the banchan were plentiful: sweet potatoes, edamame, pumpkin, kimchi, and a variety of other spicy things. Then, the stew came. The pot was massive and filled with bubbling broth, shrimp as big as the palm of my hand, clams, mussels, oysters, and… a live octopus. Yes, that’s right. There was an octopus actually squirming around in our lunch. At first, I was completely and utterly disgusted. Steve was trying to poke it with chopsticks. Then, we just let it cook. The shrimp also had heads. I usually don’t eat foods that come with faces or are still breathing when they get to my plate, but I made an exception. We sat patiently and let everything cook. The broth soon turned a deep red and eventually, there was nothing left moving. I tore into the shrimp with my fingers, carefully removing the bits that I didn’t want to consume. I sipped spoonfuls of spicy broth and scooped out tender mussels. We decided to cut the octopus’s legs off and stick its head in a bowl. Steve still wanted to cut it open, though, but when it started oozing with purple stuff, he didn’t want to so much anymore. Following lunch, we made our way back into the rain. It had only gotten heavier. We walked around for a bit, ultimately seeking refuge in a nearby mall. It was enormous, each floor more extravagant than the next. We probably spent and hour there before heading back to the guest house for a nap. We woke up at 9:30 PM and had to do something. It was still raining, but we braved it and headed over to the Bupyeong Night Market. There were so many street food stalls, we didn’t know what to eat first. We got mandu (dumplings). We ate them under the awning of some shop and decided we liked them enough to go back for seconds. The little old lady was very happy to see us again and I’m pretty sure she threw in a few extra. After, we got hotteok (a cinnamon and nut-filled pancake). The rain was so bad that we could feel it seeping through our jackets (and my purse). We went back to the guesthouse and called it a night. At lunch, I spoke to my friend Hannah on the phone. She runs the blog Paint Me a Smile (and you should all go check it out!) We actually met here on WordPress, and we’ve been following each other’s blogs for about two months now. We both came to Korea around the same time to teach English and have been having a good time sharing our similar experiences. We have been trying to meet in person for weeks now, but things kept on coming up. 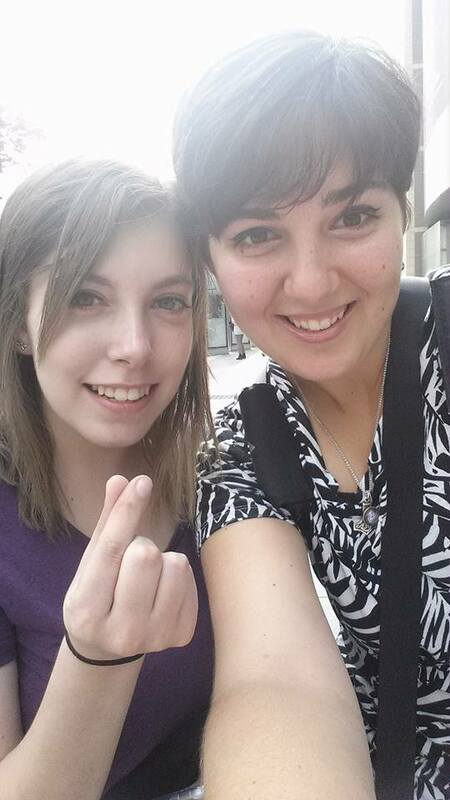 So, when we found out we were both going to be in Busan at the same, we had to make plans! Steve and I were going to make our way to Shinsegae, the world’s largest department store, in the Centum City neighborhood of Busan. We took the subway, and there was an entrance right in the station. So, we headed inside and wandered around the first level while waiting for Hannah. 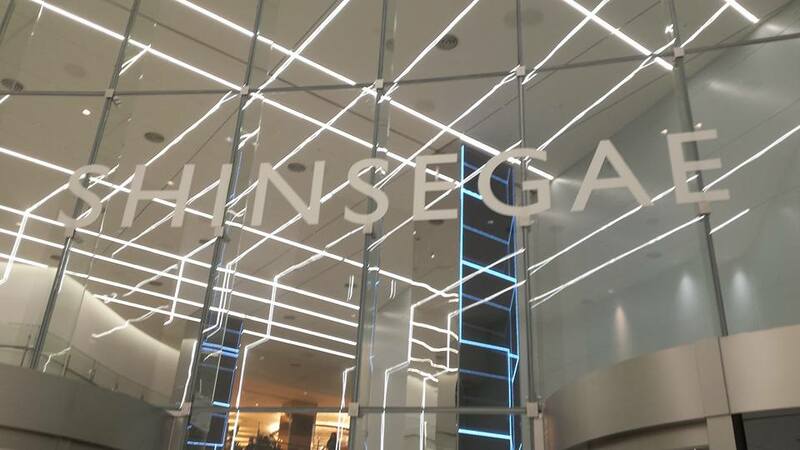 First impression of Shinsegae: insanely overwhelming. Such sensory overload! I’ve never been in a department store quite like this. There was an entire supermarket, food court, about a bazillion shops selling handbags and cosmetics (and that was only on one floor!). Finally, Hannah was here and we went to meet her! We went back inside and made our way up and down the floors. Poor Steve had to deal with our girly shopping. He did some wandering of his own, though. We spent a long time in the department store, eventually taking a break for some coffee and food. WHILE WE SAT NEXT TO THE ICE SKATING RINK. Then, we walked around Centum City for a bit until we returned to Haeundae. We went back to the market for street food and then did some more shopping. Around 6:30, we decided to head over to Gwangalli, where the fireworks festival was taking place. As soon as we got out of the subway, the sheer quantity of people out was incredible. We followed the crowds towards the beach, stopping a few times for tasty street food along the way. Hannah was trying to find some other foreigners she knew and it was nearly impossible to do so. There were police and even terrorist prevention squads everywhere. Eventually, she found them. They were sitting on the steps near the beach and Steve and I were invited to join. However, I was on the verge of a massive panic attack and could not bring myself to push through anymore people. So, Steve and I sat on the curb across the street and he brought me a drink to soothe my nerves. We still had a great view. The show lasted from 8 until 9 and it was quite possibly the best fireworks display I’ve ever seen in my entire life! The backdrop was the beautiful Gwangan Bridge and they used music from Carly Rae Jepsen to the Beatles to Whitney Houston. It was fun to sing along to the songs. There were even lasers incorporated into the show. Unfortunately, I didn’t get a single picture because my phone died and I had nowhere to charge it. After the show, Steve and I hung out at a bar to avoid the mass exodus of the crowds. We said goodbye to Hannah and, after a while, made our way towards the subway. Even though we waited to leave, it was still obscenely crowded. I was super tired and super cranky. Finally, we made it to the intercity bus terminal and headed back to Ulsan. Since I got here, I’ve been struggling to try and figure out what my Korean address is. Turns out, the whole thing is printed on the back of my alien registration card. Classic Tia. 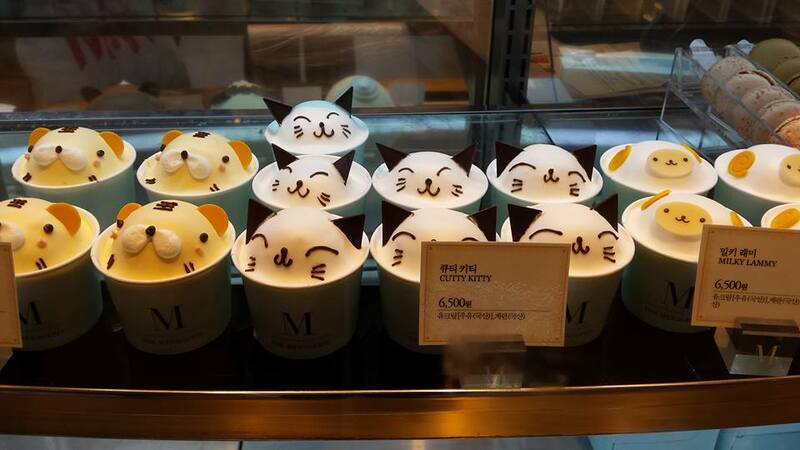 Anyway, in Korea, McDonald’s offers delivery. It’s called McDelivery. The only thing you need to know is your address in Korean. So, to my absolute delight, Steve and I decided to sit down and order last night. First, we tried doing it on the website. It was really confusing and complicated, and I almost gave up. Instead, I wondered if there was an app for it. There was. It was so simple. All I had to do was register, enter my address, and select what I wanted to eat. In less than 30 minutes, there was a delivery guy at my door and we were even able to pay by card. So, our grand plans for the evening were eating our fast food and watching Monty Python and the Holy Grail (because Steve had never seen it before!). This morning, we decided to go for a walk near the little park/river by my apartment. Instead of taking our usual route, we turned down a new street. In the distance, I saw it: Flapjack Pantry. We have been trying to find this restaurant for weeks! It’s a chain here in Korea and it serves Western-style breakfast and burgers. So exciting. We grabbed a table (with a gorgeous view of a park), and stared at the menu. Everything sounded incredible. We settled on chocolate chip pancakes and Cajun chicken salad. We also almost forgot that everything here is for sharing, and were totally surprised when our food came. There was so much! The salad was great. Fresh greens, chunks of tomato, perfectly seasoned (crispy) chicken. All in a honey mustard dressing. And the pancakes! Don’t even get my started. They were huge and fluffy and came with a side of syrup and some delightfully decadent chocolate sauce. We also ran into my friend Hailey, who was with one of her friends. They got the English breakfast to split. Totally what I’m doing next time. Now, it’s almost time for me to start getting ready for work. Happy Wednesday! I also apologize for the lack of pictures. We devoured everything immediately.